Cameron Jordan is yet another formidable pass rusher the Eagles will have to stop. Yesterday we analyzed five matchups to watch when the Saints have the ball. Here are five matchups to watch when the Eagles have the ball. Last Sunday, the Eagles faced the No. 1 run defense in the NFL during the regular season in the Bears, a team that gave up just 80 yards per game on the ground this year. This Sunday, they'll face the No. 2 run defense in the NFL in the Saints, a defense that gave up 80.2 rushing yards per game. If you're thinking, "Well, the Bears have a great defense, while the Saints just had big leads, so nobody tried to run it on them," you're partially correct. 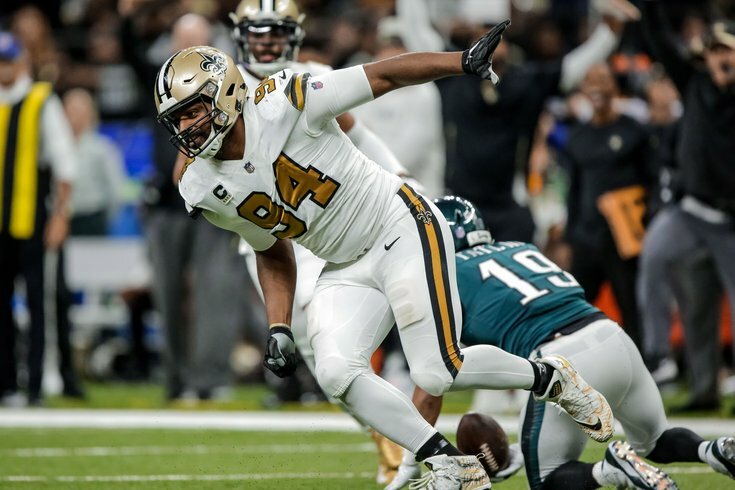 The Saints faced the fourth-fewest number of rushes this season, which certainly helped their overall numbers, but they also only allowed 3.6 yards per carry, which was second in the NFL. They are indeed a good run defense, regardless of usually having the benefit of the lead in games. Last Sunday, the Eagles were unsuccessful running the ball, as they had 23 rushes for 42 yards, for a paltry 1.8 yards per carry. They kept running it anyway, perhaps knowing that they had to keep the ball-hawking Bears defense honest. When the numbers so clearly and obviously say that it's easier to move the football through the air than it is on the ground, I'd probably just go with what works. Obviously, getting into a shootout with Brees isn't exactly ideal, but the Eagles don't have to. There are many forms of controlling the football, and you can do so with a pass-heavy offense. You probably just shouldn't be running to the line of scrimmage after every play like you're Chip Kelly. The Saints' starting corners are Marshon Lettimore and Eli Apple. Lattimore is very clearly the better player of the two. Apple was acquired at the trade deadline by the Saints for fourth-and seventh-round picks. Before the trade, Apple of course played for the Eagles' division rival, the New York Giants. Mike Groh was asked specifically about Apple, and he gave a predictably bland response. "I think he's played really well since he's made the transition to New Orleans, so we have a lot of respect for Eli," Groh said. "He's made some really good plays. You can see him on tape and growing in confidence on that system." Mmhmm. Expect the Eagles to target Apple. Maybe Apple is another Howie Roseman sleeper cell agent that Roseman can activate like he did last Sunday with Cody Parkey. In the Eagles' Week 11 matchup against the Saints, Ertz had his lightest production of the season, when he caught just two passes for 15 yards. The Saints clearly attempted to take Ertz away from Carson Wentz, and they successfully did. Fortunately for the Eagles, that will be harder for the Saints to do this time around, as there's a strong argument to be made that Alshon Jeffery, Nelson Agholor, and even Golden Tate are playing their best football of the season for the Eagles. Add in that Darren Sproles is now healthy and contributing in the passing game, and Ertz is no longer the obvious "We must take him away at all costs" target for the Saints' defense. Many of the Saints' linebackers and safeties are better against the run than they are the pass. In the last four games of the regular season, the Saints allowed four TDs to tight ends. I believe the Eagles would be wise to get Ertz and Goedert involved early to start drawing attention away from their other weapons. The Saints were tied for fifth in the NFL this season with 49 sacks. Cameron Jordan led the team with 12 sacks, followed by Sheldon Rankins with 8. Jordan and Rankins may feel like child's play when compared with Khalil Mack and Akiem Hicks or J.J. Watt and Jadeveon Clowney, but certainly, this pass rushing unit is another formidable challenge for the Eagles' late-season MVP(s), their offensive line.